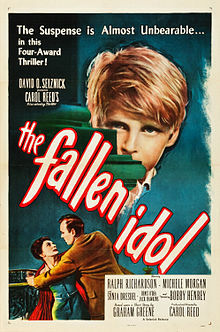 Everything is a lie in Carol Reed’s 1948 adaptation of Graham Greene’s short story, "The Basement Room," The Fallen Idol, which is currently being revived at Film Forum. The truth, which is that an accident occurred, is conceived as a lie, as are all the alibis told to protect the innocent. “The trouble is, we’ve told a lot lies” is a line from the script that could be the film’s mantra. The germ of the story has to do with Baines (Ralph Richardson), a butler who runs the French embassy with his wife (Sonia Dresdel). Unhappy in his marriage Baines is having an affair with a secretary, Julie (Michele Morgan). Reed turns the screen into a twisted cubist canvas in which everything is perceived at an angle or from the point of view of Phillippe (Bobby Henrey), the son of the ambassador who’s left in the care of the help. Certain scenes stand out, but there’s one where Phillipe, hidden under a table identifies Mrs. Baines, the murderer of his pet snake Macgregor, by the sight of her matron's shoes. It’s an indelible moment of aggression and suspense. To complicate the dissociated quality of this masterpiece of misperception, Greene’s story presents a proto Upstairs, Downstairs in which the servants have intermittently become the masters of the house. So the universe has a topsy turvy quality from the start and watching Richardson one can’t help thinking of the role Dirk Bogart would play in Joseph Losey’s The Servant (1963), 15 years later. English society was and is a parody of stratification and no one draws the underclass with more acuity than English directors. But the most astonishing moment of the film might be the very last scene in which Philipe’s parents' return. Phillipe has been separated from his mother, in particular, for some time and what should be a joyous reuniting introduces one final level of unreality. It’s as if she were a footnote to the boy’s life, as if she'd never existed, and it poses the question of how a child, who lives in an imaginative present, can ever find truth in the stories he or she is told.